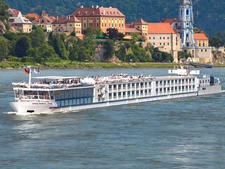 Launched in 2006, MS Excellence Rhone is a slightly smaller river ship at 361 feet long, carrying a maximum of 142 passengers in 71 staterooms and suites. 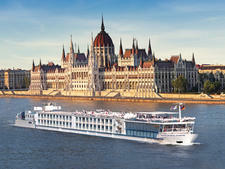 It spends the year in France, cruising the Saone and Rhone Rivers. Accommodations are divided between two categories of Window Staterooms, 69 Standard French Balcony Suites, Larger French Balcony Suites, and two spacious Owners Suites. 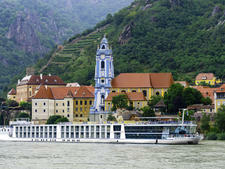 There are 14 Window Staterooms, which are the smallest at just 129 square feet, and they're located on the Lower Deck. The three Standard French Balcony Suites are a notch up in size, at 161 square feet, and they're located aft on the Upper Deck. The majority of accommodations are Larger French Balcony Suites at 172 square feet, spanning the Middle and Upper Decks. The Owners Suites are on the Upper Deck aft, with views over the wake and 194 square feet of floor space. Facilities across the categories include a deluxe queen-size bed, a vanity with a hair dryer, a minibar, a flat-screen TV, a closet with a safe, a bathroom with a shower, and a deck. Window Staterooms have two portholes each, while the two categories of French Balcony Staterooms benefit from floor-to-ceiling sliding doors. The Owners Suites have an additional sitting area, a floor-to-ceiling glass window and a French balcony. The very top Sun Deck has an open area for relaxing and a glassed-in Sky Lounge offering panoramic views. MS Excellence Rhone has a second lounge and bar, a library and a dining room, as well as an elevator between the Middle and Upper decks. 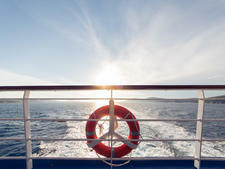 There is no fitness center or beauty salon onboard. Travelmarvel is a cruise line largely catering to Australian and New Zealand cruisers, offering a value-for-money experience that is also comfortable and stylish. 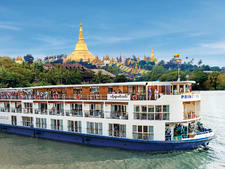 A bonus is the many inclusions, such as sightseeing, included gratuities and port charges, and complimentary use of bikes and wireless Internet. Also available 24/7 and free of charge are coffee and tea, with bottled water provided daily. Lunch and dinner also come with complimentary local beer, wine and soft drinks. A highlight of Travelmarvel's offerings is its Insider Experiences, which allow passengers to 'live like a local' while gaining insights into a destination's culture and customs. Experiences range from learning about the production of Schnapps at a family-run distillery in Austria to enjoying a private Oktoberfest event in Bavaria or attending a paella cooking demonstration in Spain.